Hip No. 441, a colt by Majestic Warrior consigned by Harris Training Center, Agent, went to Narvick International for $400,000 to top the second session of the Ocala Breeders’ Sales Company’s 2012 Spring Sale of Two-Year-Olds in Training. The chestnut colt, who breezed an eighth in :10 1/5 at the Under Tack Show, is out of Flirtatious Miss, by Mr. Greeley, a half sister to graded stakes winners Across the Rhine and Prospectress. Hip No. 363, a filly by Keyed Entry whose quarter in :20 4/5 was co-fastest at last Wednesday’s Under Tack session, went to John Fort for $260,000. Consigned by H.J. Parra Racing Stables, the bay filly is out of Dixie Image, by Halo’s Image, a full sister to millionaire grade one winning OBS graduate Southern Image. Hip No. 398, a colt by Political Force consigned by Azpurua Stables, Agent, was sold for $260,000 to Bear Stables, Ltd. The gray or roan colt, who worked a quarter in :21 2/5, is out of Endless Virtue, by Monarchos. Hip No. 518, Foundthecandy, a filly by Candy Ride (ARG) consigned by Old South Farm, Agent, was sold to Cam Allard for $230,000. The chestnut filly, out of Harlow Gold, by Orientate, a half sister to graded stakes winning OBS graduate Sea of Tranquility, worked an eighth in :10 flat, co-fastest at Wednesday’s Under Tack session. Hip No. 469, a colt by Tiznow whose eighth in :10 flat was co-fastest at Wednesday’s Under Tack session, was sold to Mark Casse, Agent, for $225,000. Consigned by Ricky Leppala, Agent, the bay filly is out of Gdanska, by Danzig. Bear Stables also paid $175,000 for Hip No. 415, a colt by Harlan’s Holiday consigned by de Meric Sales, Agent. The gray or roan colt, who worked an eighth in :10 2/5, is out of Fabulous Sun, by Maria’s Mon, a half sister to stakes winner Colony Band. Hip No. 488, Spare No Expense, a colt by Wildcat Heir consigned by Journeyman Bloodstock (Brent and Crystal Fernung), Agent, went to Steven W. Young, Agent, for $170,000. The chestnut colt, whose quarter in :20 4/5 was the session’s co-fastest, is out of Golden Horseshoe, by Belong to Me, a daughter of stakes winner Striking People. 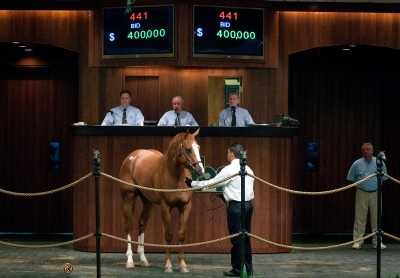 For the session, 197 horses sold for a total of $8,731,500, compared with 223 horses bringing $7,247,900 last year. The average price was $44,322, up 36.4% from $32,502 a year ago, while the median price rose 50% from $20,000 in 2011 to $30,000. The buyback percentage dropped from 20.1% a year ago to 18.9%. Eighteen horses sold for $100,000 or more compared with 20 last year. The Spring Sale continues Wednesday at 10:30 a.m.